To get the game see Download_and_Install! The main menu is what it is. It is allows you to select several sub menus discussed more in detail below. Here are the single player campaigns. Train with these to be fit for YOG. Here you can load games for single player mode. It doesn't matter if you saved them in YOG, a LAN game, a custom game, a campaign or a tutorial. Auto save games can also be loaded from here. This button connects to the YOG server so you can easily play against others. Here you can chat with others, create a game or join games. Why are they marked grey and I'm green? 'They' are in the chat room via IRC. That means they don't have glob2 running but are principally ready to come in if someone asks to. Simply click the game you want to join and then click Join. Maps will be transfered automatically if needed. If this fails, most likely the game versions don't match. After clicking on Create game a menu pops up where you can choose a map or a game (for example the autosavegame of the game that just crashed). By clicking on the maps you get a minimap and infos like dimensions, teams and date of creation. After pressing Ok the others on YOG will see the game and can join. By clicking on the colors of the players the host can change them. Same color is not same team but same people. That means the players with the same color will share the control of one people. The host can also add AIs to any color. 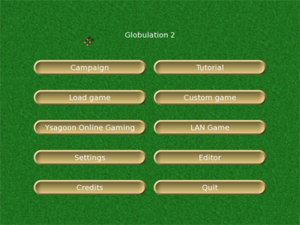 In August 2006 Globulation 2 supported 20 different languages. In windowed mode you will not be able to navigate by moving the pointer to the border of the screen. Globulation 2 supports any modes your graphics card claims. If you experience speed problems, opt for a low resolution. If you experience speed issues check if you are just emulating OpenGL. that is to my knowledge only the cloud shadows. switch off this cute feature if you are on a slow system. this feature allows you to assign as many units to a job as you have assigned the last time to a similar one. so far this only switches the event sensitive background music on and off. in this tab you can set the default unit count for the flags, buildings, building upgrades and construction sites. here you can modify the default hotkeys for the game and editor. Here you can read who's giving this game to you. Here you can play these introductory missions to learn the basics of the gameplay. Here you can choose a map to play against the various bots. If you have no internet it is also possible to play against each other without YOG via this button. You will have to know your IP. Your IP can be checked here, for instance. Globulation 2 makes it easy to everybody to set up their own maps. For detailed info please have a look at our map editor guide. Well ... Any questions about that? this number is red, as there are more workers assigned to jobs than there are in total. all the 2 explorers are free to be assigned to an exploration flag. your prestige/total prestige on the map/prestige needed to finish the game. You get prestige with level 3 schools. this is the number of globs that have converted to and from your team. Globs can be enticed to convert to different teams if the enemy offers a wider variety of fruits at their inns. this bar indicates if the game is slowed down by the limitations of your system. As long as it is green, everything is fine. Past this white line indicating 100% it turns red. At 200% the game runs about at half the speed it is designed for. if this bar is all red, please try to fix that before joining a game on YOG. You can also ask on the game chat for help to get the game go faster. As a rule of thumb the game should be playable on a 1GHz CPU without accelerated OpenGL. this circle in the screenshot is the button to access the menu where you can load/save the game, make alliances, change in-game options and quit the game. these are for buildings, flags and special areas, statistics and graphs. Here you see what's going on. You can click the buildings and flags to adjust settings. The units can also be selected to see their status but not to control them directly. When in the building panel on the right side of the screen, you see thumbnails of buildings. Hover over those thumbnails to see more details about construction costs. Click on a building. There is a "destroy" (hotkey d) button at the bottom right of your screen. Click it to delete the building. If you can, there will be an Upgrade (hotkey u) button just above the Destroy button. When a building is damaged, you will also see a Repair (hotkey r) button which asks your creatures to repair the building. The left one indicates how much wheat is in your Inn/Swarm. The right one, also found at training buildings, indicates how many globuls are inside. It tells you how many globuls are eating (for the Inn), how many warriors are training (training camp) etc. There are many type of buildings documented on the buildings page. or build more compact. In this picture you have more buildings, all are accesible and you will have less jams except for when you do upgrades. Food, hit points: there should be creatures of the same color as your Swarm in your main window. There are a blue and a green bar under each creature. 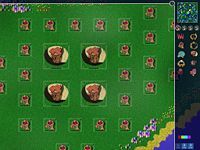 The blue bar shows how much food the creature has left, and the green one indicates its hit points or life points. If the blue bar is empty, your creature is starving, and its hitpoints will decrease. Other informations: Click on one of your creatures. It is probably a worker. On the right side of your screen you can now see how hungry and healthy it is, what it is carrying, and how good its abilities are. Other statistics and information on your units can be seen if you click the fourth of the buttons located directly under your mini-map. There are detailed informations on health and many others. You cannot give any kind of orders to your creatures. This is done indirectly through your buildings and flags. You can use the t key to show/hide the path to the current target of the selected unit. Other units besides the Workers are the Warriors and the Explorers . The Warriors can attack other land creatures and structures; they can be improved via the training camp, the pool, and the running court. They can be recognized as the units with big arms. The Explorers will keep your map up to date and show you live units that are within their sight. They can attack other flying objects and when they've been through a school of level 3, they can attack ground creatures. They can be recognized as the flying units. All creatures eat in inns, they will each take one fruit of each available variety and one unit of wheat. Their satisfaction level will depend on the fruits they had (from 0 to 3) and will determine whether they are attracted to the enemy's inns. When you ally with someone, there won't be fighting between you. Convert all of your enemy's globs to your team by using fruits. In practice, most games are won through a combination of the first two, while the last (prestige) is only used when stalemate has long been reached. The swarm allows you to build more units, and, depending on how many units you want, you should build one, two, or maybe even three swarms. Look at how much food you have to decide how many units you can maintain. In this game having more units is not always better. Units that are hungry will certainly die very fast. Barracks will improve the strength of Warriors, a Racetrack is needed if you want your units to move faster on the ground, and a Swimming Pool will allow your units to move through water. Depending on your priorities, now decide to build one of these three buildings. Upgrading your buildings vastly improves their effectiveness. But to do so, you need a School. To build a School, your creatures need to be able to swim, so that they can collect the Algae. Therefore, we must build a Swimming Pool first. When it is finished, place a School. Other useful structures to have are the Defense Tower and the Wall. A defense tower surrounded by or on the other side of a wall is especially hard for the enemy to destroy, and low-level warriors won't be able to do much damage to a defense tower anyway (but they can kill workers assigned to it, causing it to run out of ammunition). Walls can also keep resources from growing in annoying places and can isolate resources you have no plans to exploit or wish to keep out of reach of enemy workers. 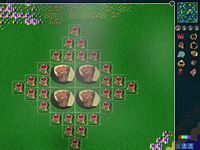 Against another human player, there can be a rush to destroy each other's nearby algae completely to prevent the enemy from having advanced buildings too easily. AI are not smart enough to do it to you, but certain players have been known to try it every game! So send a few warriors to protect yours. Defense towers are nice for this purpose as they don't require feeding and won't convert to the enemy; but to fight an algae genocide rush, you need warriors who can swim. As soon as the first workers have finished school, you get the option to upgrade buildings. Swarms, Markets and Stone Walls cannot be upgraded, others buildings can be upgraded twice. To upgrade to higher levels, you must first upgrade your School and train some workers (it's a common error to assign 20 workers to upgrade something ASAP when only a few have the proper build level - be careful). Workers trained in School can not only upgrade buildings, but also gather resources much faster. As a general rule of thumb explorers are weak against towers, towers are weak against warriors, and warriors are weak against explorers (once the explorer ground attack is researched). Take your time to build all these buildings. The most important resource for your creatures is food. Once you have enough food and workers upgrade buildings one by one. Assign more workers when upgrading, and it will take less time until the new and improved building is available. Don't wait for a building to be finished slowly. And don't forget that after your building is upgraded, you still need all your units to train inside your building. It will take some time until you will see your units go faster or fight better. Also don't forget to manage your units with flags and special areas.